Eperchomai is Greek meaning to overtake or come upon. This original painting was done with acrylic paints on hardboard. Eperchomai means to overtake or come upon. When the Holy Spirit "came upon" Mary, she conceived Jesus. When the Holy Spirit "came upon" Jesus, He was empowered to start his ministry. When the Holy Spirit "came upon" the people in the book of Acts, they spread the Gospel around the world. 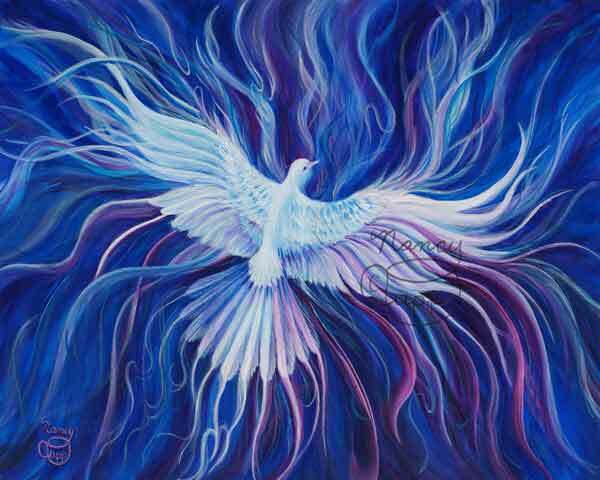 Today the Holy Spirit is intensifying from its initial impact and about to explode upon the world scene as the return of Jesus, the Messiah, gets closer and closer. Hallelujah! A white dove has been symbolic of the Holy Spirit ever since the time when Jesus was baptized by John the Baptist, his cousin. When John the Baptist baptized Jesus, he tried to describe what he saw. He saw something come down from heaven that looked like a white dove descending upon Jesus. Since that time, white doves have been symbolic of the Holy Spirit. Before Jesus ascended into heaven after his resurrection from death, he told his disciples to wait in Jerusalem until they received power from on high.